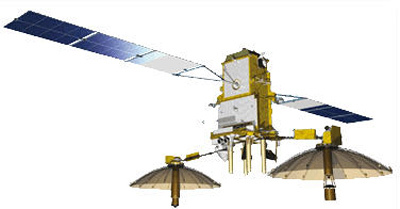 The Luch-5 are the russian follow-on relay satellites, which replace the Luch (Altair) and Luch-2 (Gelios) satellites. Two satellites named Luch 5A and Luch 5B were procured for launches in 2010 and 2011. The smaller satellites are based on the Ekspress-1000 bus and were be launched with a co-passenger on Proton-M Briz-M boosters. Luch-5V was ordered to replace the larger Luch 4 satellite, which has been postponed to 2015 and reduced to an experimental satellite. The Luch-5A and -5V spacecrafts are also intended to receive COSPAS/SARSAT signals in the P-band and relay them in the L-band to the ground data receiving points. In addition, both will allow collection and transmission of the Planet-S System hydrometeorological data.